Vinod Patel with priest Madhubhai. 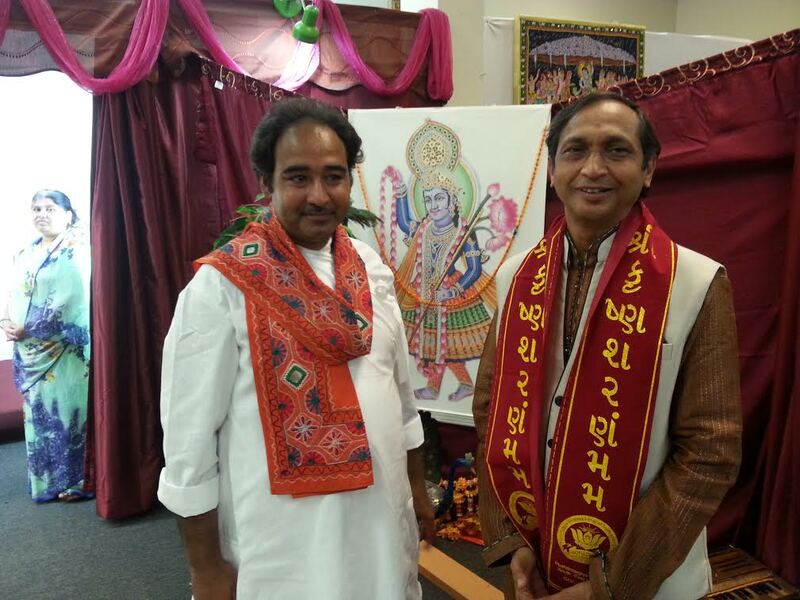 Atlanta, GA: Gokul Dham in Atlanta organized a musical concert, ’Sangeet Sandhya’ by noted Gujarati singer Vinodbhai Patel who is on a U.S. tour from April to July, and currently is in Atlanta. The concert was held in Global Mall,Norcross,Georgia on Saturday, June 13,2015. Vinodbhai was accompanied by Ghanshyambhai Dholaria on drums and Vijaybhai Panchal on manjeera. He began the program with invocatory shlokas on Lord Ganesha and other deities. 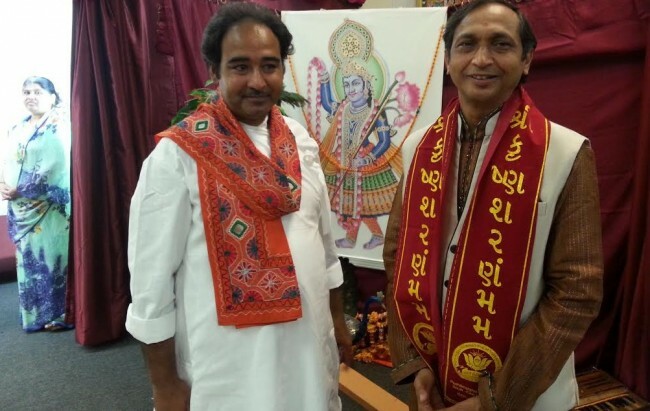 Gokul Dham’s secretary Tejas Patwa introduced Vinodbhai who is an international singer of repute and hails fromRajkot,Indiaand has the honor to be the first Gujarati singer to be honored by the Mayor of New Jersey and theCanada’s Parliament. He is also the proud recipient of “Gujarat Gaurav Award 2013” fromGujaratSangeetNrityanatakAcademy, Gandhinagar and also an Award from Sargam Club,Rajkot, presented by Narendra Modi. During the four-hour long program, Vinodbhai with his gifted and well-cultivated voice, kept the audience engaged and entertained with his anecdotes, quotes, poems, bhajans about Meerabai, Lord Krishna, Sant Kabir; poems by famed Gujarati poets like Ramesh Parekh, Adam Tankarvi; Dula Kag to name a few. He interspersed these with lighthearted jokes about Jaan kaka and his nephew. During his program not only he recited vintage poetry but also explained its meaning to help the audience enjoy its full flavor. Through his music recitals, he tried to give his audience a glimpse into, and awareness and appreciation of the rich culture and traditions ofIndia. He tried to remind the audience about personal life- values like friendship, respect for parents, gurus, mentors, love, respect and faithfulness between husband and wife, and to serve the community rather than wrongfully cling to power and status. He narrated the famous episode in Mahabharata about the meeting between Lord Krishna and his close friend Sudama as an example of true friendship. “Respect your parents. When Yudhishthira once asked Yaksha, “Who is the most tolerant person”, Yaksha replied, “Mother”. And to the question, “Who is vaster than the sky?” Yaksha replied “ A father’s heart”. Vinodbhai sang ‘Ghar ma Kashi, ghar maMathura, nathi javu mare Tirath dham’ to stress respect for parents. For those who abuse their positions and power he had this amusing couplet,”Khurshiya (chairs) jabi aai hei zaalimon ke haath mein; yoon laga banduk (gun) aai hein bandaron (monkeys) ke haath mein”. Vinodbhai narrated this anecdote to reinforce the importance of loving, caring and being faithful in married life. It was time for an interval and enjoying ice-cream served by the Gokuldham volunteers. After the interval, Vinodbhai narrated the Krishna Leela so some members in the audience quickly got up to perform a zesty and joyful garba to the popular Gujarati song ‘vanravan chhe rudu’. The audience relished it all, tapping their feet or clapping their hands as Vinodbhai sang more timeless bhajans and songs. Vinodbhai requested the attendees to buy his DVD ‘Gokul ma Tahukya Mor’.He further requested them to donate generously to Gokuldham so the dream project of Gokuldham Haveli can become a reality in the nearest future.